It dries smoother and slightly harder than my previous recipe, without being too crunchy or losing any flavor. 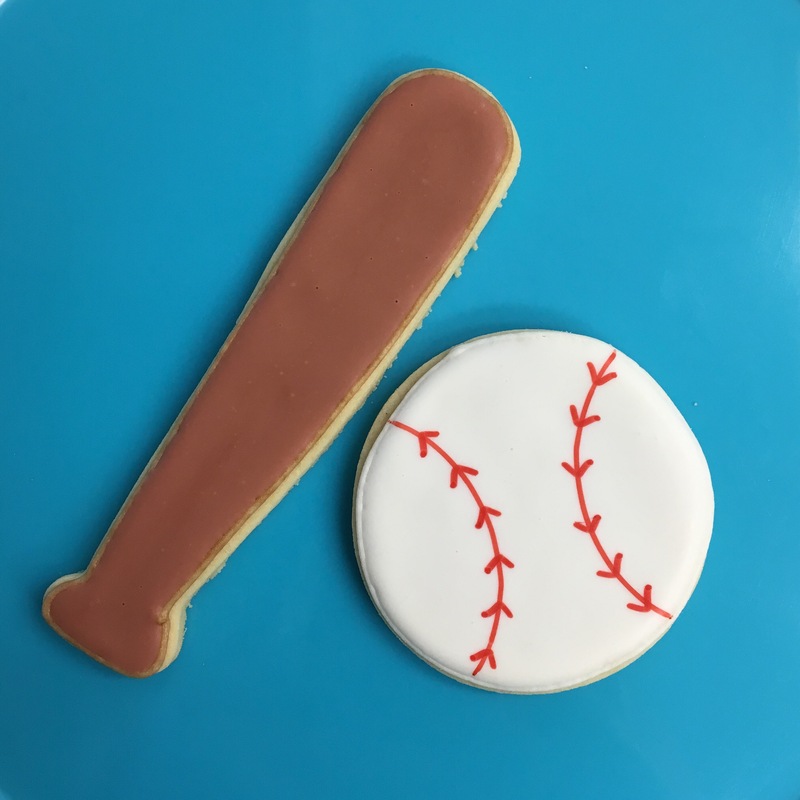 When making these baseball cookies for a friend’s son’s birthday, I decided to try using edible markers – something I couldn’t really do with my old icing. It worked PERFECTLY! 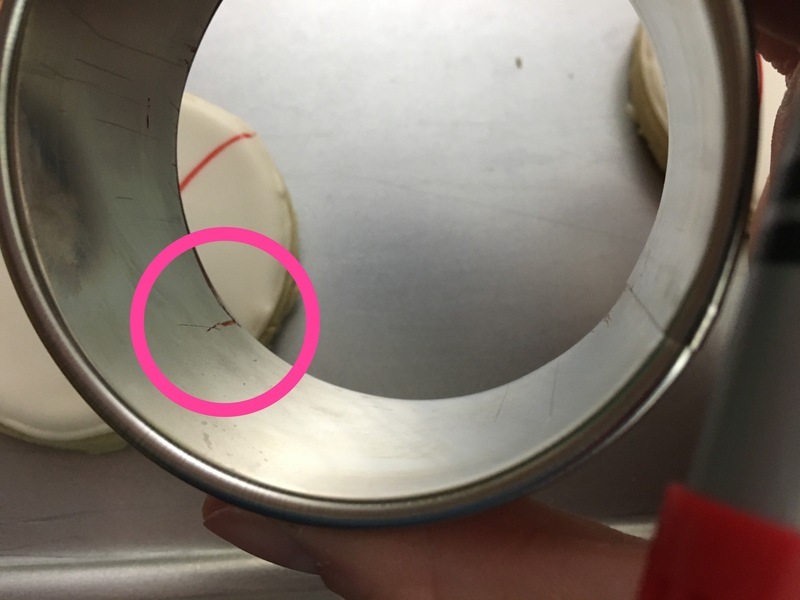 …and marked the cutter where it met the edge of the cookie. 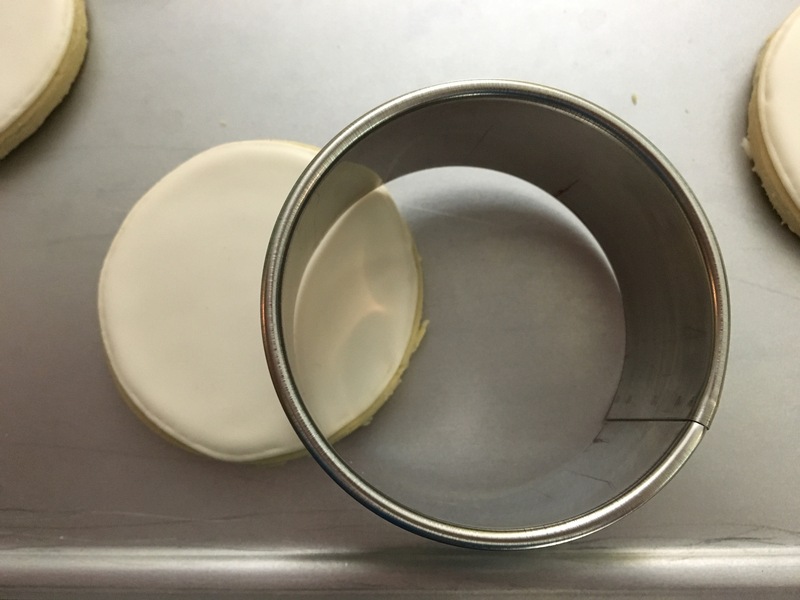 This way the curve was the same size on every single cookie. Then I just added the stitching, making sure each curve had the same number of stitches. The spacing doesn’t even need to be perfect for the balls to all look great! I also made some bats to go along with the baseballs. These were SO easy and stunning and took no time at all! I will definitely use the markers again for balls instead of piping all of those lines. My mind is racing with everything else I can do with the markers now! 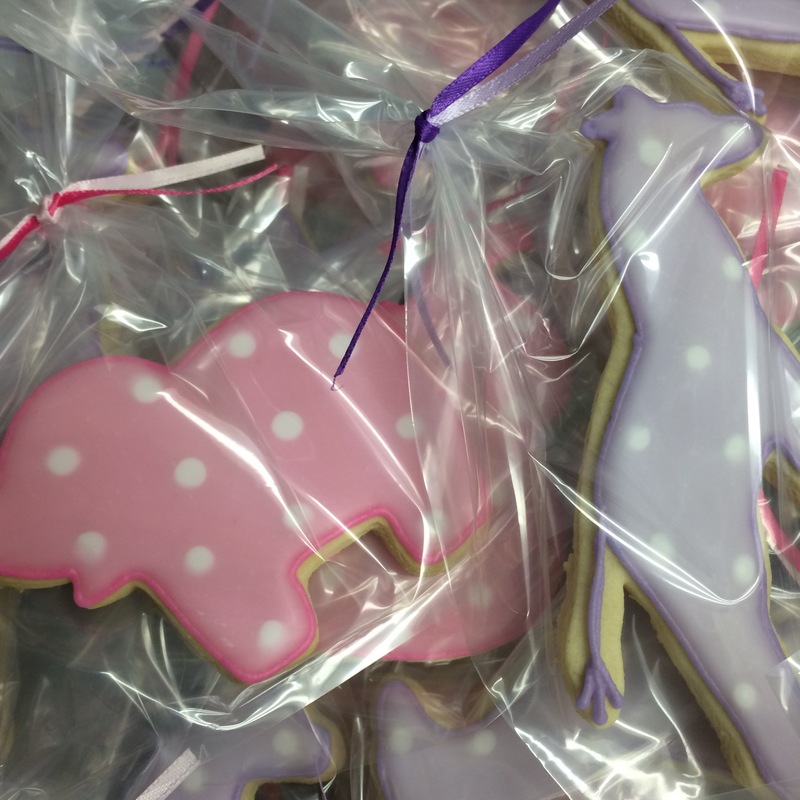 **Not that you can tell from the pictures, but these cookies are actually gluten free and vegan! I used this recipe for the cookies and these recipes for the buttercream and icing. I just substituted rice flour and rice milk, and used all vanilla extract instead of using almond. 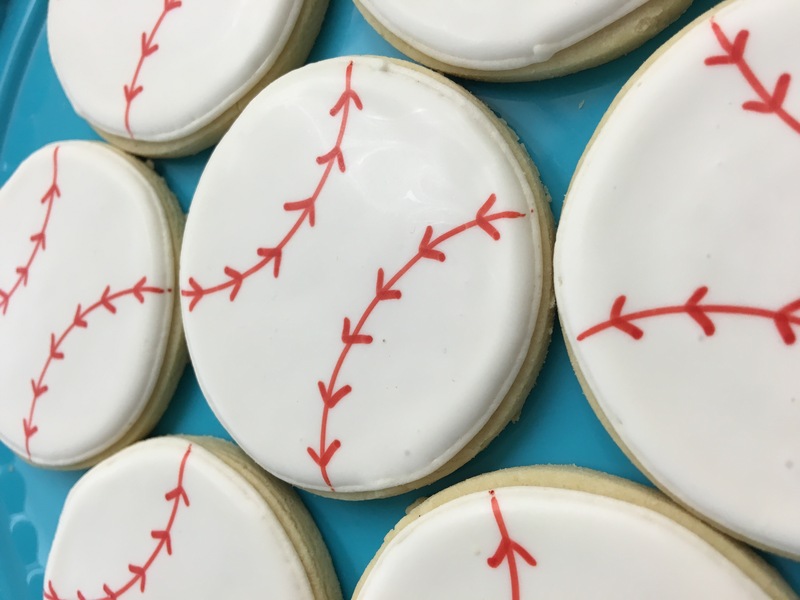 I outline all my sugar cookies in buttercream frosting. Not only does it taste amazing (duh, it’s buttercream), but it holds shape well and gives me texture I can’t get with my normal runny frosting. 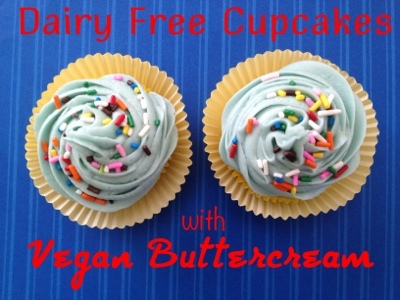 A while back (when I made these) I made vegan buttercream using vegan butter. I made it a little bit different this time, but honestly it’s super adaptable so you can go many ways. 1. Dump powdered sugar in the mixing bowl, and top with the vegan butter, cut into small chunks. 2. Add the almond milk and vanilla and beat until smooth. The next part was more challenging. I normally use an icing made of just powdered sugar and milk, and it dries into a nice hard icing. THANK GOODNESS I tested the icing with almond milk the night before I needed it. It never set up! (Even 3 days later!) Once I realized this, I jumped into plan B. Pam at Cookie Crazie to the rescue! Pam is a minority in the cookie decorating world because she uses Glaze instead of Royal Icing. 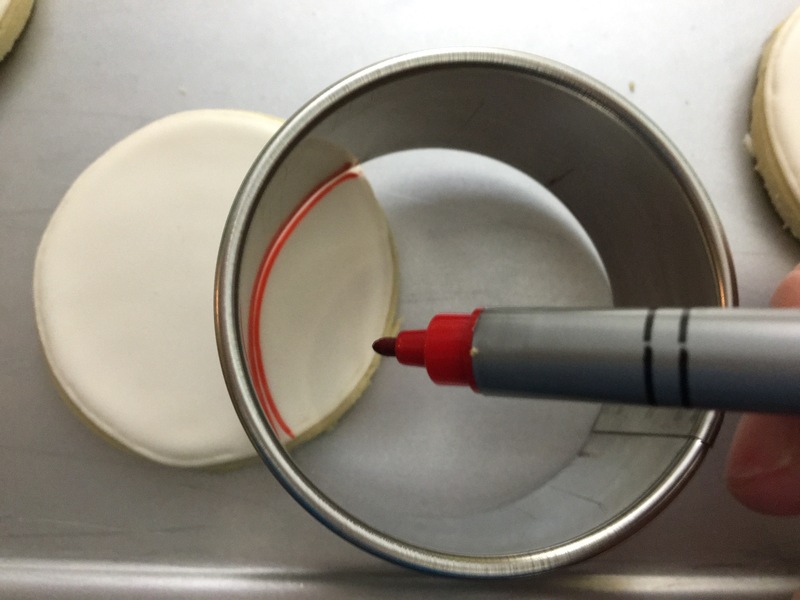 Royal Icing is made with either egg whites or meringue powder (which is made of egg whites). Glaze is made with corn syrup and water! Perrrrfect for vegan cookies. As I had never made actual Glaze before, I started with Pam’s recipe and tweaked it just slightly. 1. Mix all ingredients together, adding white food coloring last. This icing is so lovely. It flows only slightly thicker than my icing, but works pretty much the same way. And it dries so much nicer than mine. I was bummed that I didn’t have any extra cookies for the shower so that I could taste one with the icing. The next cookies I make I’m going to use Glaze again so I can taste test. 🙂 It might just be my new icing of choice! I recently made vegan sugar cookies for the first time. I was stressed about it because I was planning on using an egg substitute that I’d read about but I couldn’t find it in any of my local grocery stores. I’ve used vegan butter in the past (when I made these) so I knew that wouldn’t be a problem. We came across this recipe from Betty Crocker, and it seemed simple enough so I went with it. I only changed 1 thing – I used almond milk instead of soy milk because that’s what I had on hand. If someone has a nut allergy, make sure you use the soymilk! The dough was a little hard to work with, as it was very crumbly. My usual dough is pretty sticky so it was a challenge for me. But I didn’t have to use even a sprinkle of flour. I rolled it right out on my board and went to baking. The first sheet I only baked 3 cookies on. I didn’t want to waste my time rolling it all out if they weren’t going to bake well or taste good! Well….. they were SO SO yummy! Like almost good enough to use just this recipe from now on! Almost. The crumbly dough part will keep me from that. Next time I will tweak it a little bit to try to get it a bit wetter/stickier. 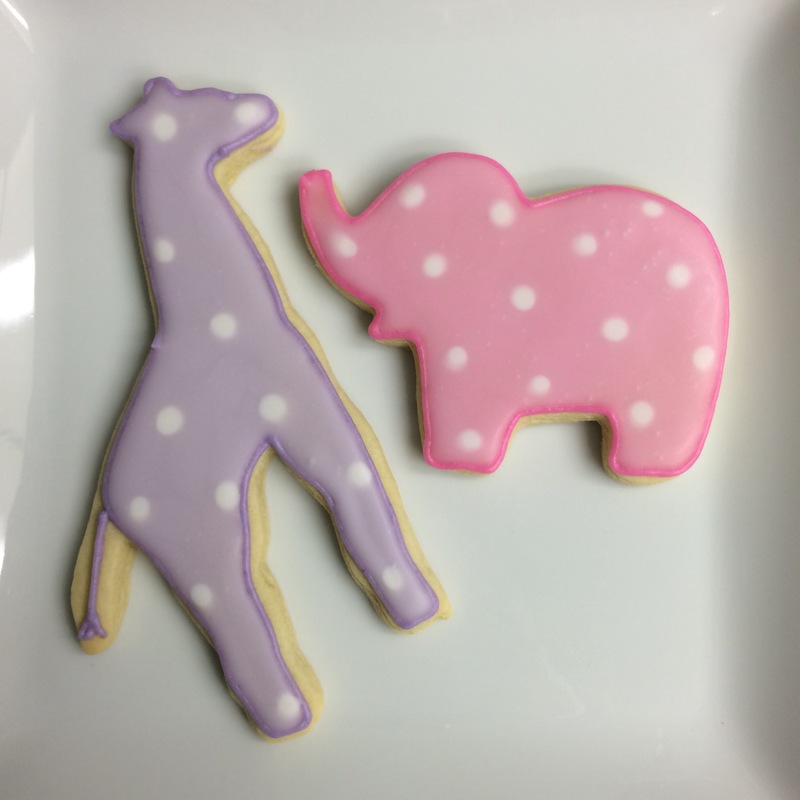 For now though, this recipe is perfect for anyone looking to make vegan sugar cookies, so I wanted to share! 1. Mix together powdered sugar, butter, almond milk, vanilla, and almond extract. Add cornstarch, baking soda, and cream of tartar. SLowly add flour. Knead well to help mix in the crumbles. 2. Roll and cut, then bake at 375* for 7 minutes. Let cool for a couple minutes before moving to a drying rack. Here is the coordinating Vegan Buttercream and Vegan Glaze receipes to top the cookies. I made these cupcakes for Baby Jude’s 1st birthday! Due to some dietary restrictions, his treat needed to be dairy free. I bake with milk and butter and all that good stuff usually, so I had to do some research to find a recipe that was able to be made dairy free. What I found was the BEST THING EVER. 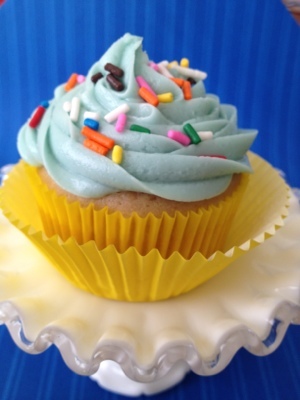 A cupcake recipe that makes 2 cupcakes. I know what you’re thinking. Whaaaaaaaat!? And it was easy too. I have a feeling I will be coming back to thing recipe again very soon. Small batches = opportunity for experimentation. Like I did here. Anyways, back to these cupcakes. 1. In a bowl, whisk together egg white and sugar until combined. 2. Stir in melted butter and vanilla. 3. Add flour, baking powder, and salt and stir until completely combined. 4. Stir in the coconut water. 5. 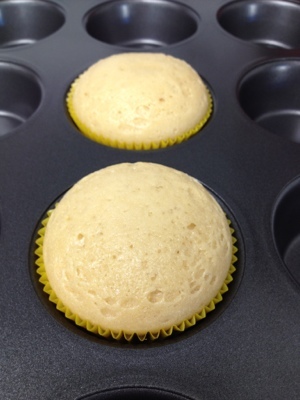 Divide equally between 2 cupcake liners in the center of the cupcake pan. **Note** This cake recipe can be flavored with anything you want. Substitute the vanilla for almond or lemon extract, or substitute some of the coconut water for pureed strawberries, raspberries, or blackberries. Now for the frosting. I had never made vegan frosting before, but I was confident it wouldn’t be a problem. 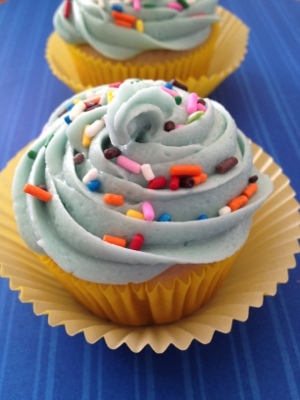 My regular buttercream recipe is very adaptable so I started there and ended up with something wonderful. We even had a taste test comparison and everyone said tasted the same. Awesome. With a hand mixer or a stand mixer, mix together all ingredients until fully incorporated. If the mixture is too thin, add powdered sugar a little at a time until it reaches the right consistency. **Note** This frosting can be flavored with anything you want. Substitute the vanilla for almond or lemon extract, or substitute some of the coconut water/non-dairy creamer for pureed strawberries, raspberries, or blackberries. If it gets to thin, add powdered sugar. If it gets too thick add more coconut water/non-dairy creamer. Easy!